The creative thinkers over at Google recently ran a contest for programmers, economists, data geeks and any other interested parties to create a web tool to help taxpayers understand what they pay in federal income taxes and where the money goes. Using data sets provided by Google and their partner Whatwepayfor.com, entrants came up with a variety of different concepts, including a grocery store-style receipt (similar to the calculator on the White House website) , a clock, and an array of charts, graphs and figures. The video below gives an overview of the submissions. The contest grand prize winner of this data visualization challenge was Anil Kandangath’s “Where Did My Tax Dollars Go?“. Google’s prize jury noted that his entry is rich in information but with an elegant design that allows users to interact with the visualization without losing the “big picture.” Google blogger Jenny Ramaswamy wrote that “Anil’s entry is a great example of how data visualization can take boring, complicated, but critically important information and make it accessible to everyone.” Mr. Kandangath received $5,000 and, as noted by ubergizmo, his 15 minutes of fame (hopefully extended somewhat by this post). 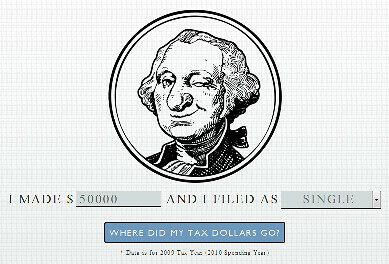 The Tax Foundation, of course, has its own set of interactive tools, including the most-recently-launched offering, the 2011 Marginal Tax Rates Calculator. Take a look at how your income tax burden shifts as your income level changes – and graph the results.